I love that all Pinkberry locations around the world in over 20 countries ensure that the same taste is maintained, and they all use the freshest ingredients to make the frozen yogurt. The fruit is freshly cut everyday in-store; it is never frozen, in syrup or canned. The Pinkberry franchise that is in Ontario uses nonfat milk from Dairyland and nonfat yogurt from Dannon using the specification that makes Pinkberry Frozen Yogurt unique and flavourful. 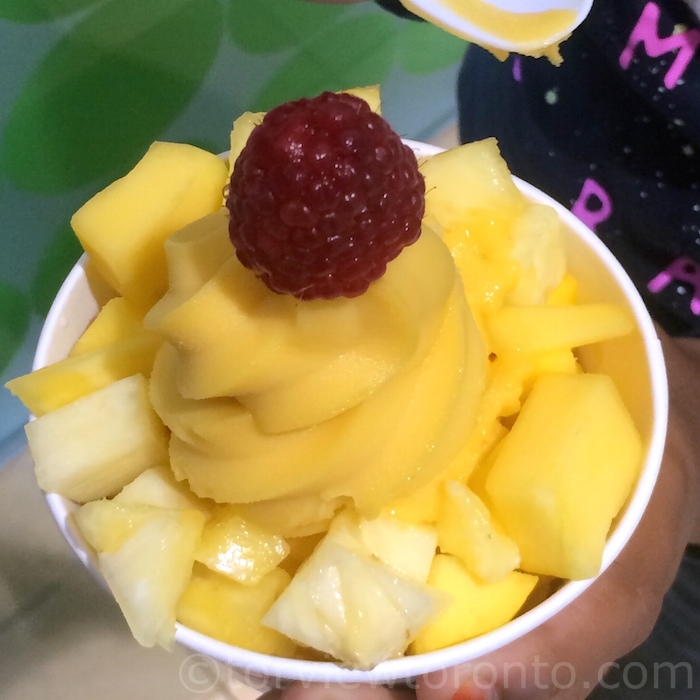 We love how each cup of the light and refreshing frozen yogurt is swirled and beautifully topped with fresh fruits and toppings of our choice before being presented and served as a gift to the customer. The Pinkberry Square One location is serving Pinkberry’s six distinctive flavours: the signature Original flavour, has a sweet honey taste and a slight tanginess; Pomegranate, a bold and tangy flavour made with 100 percent California-grown pure pomegranate juice; Chocolate Hazelnut, a creamy, delightful chocolate with a hint of sweet hazelnut that has a light flavour of Nutella; Dairy-Free Tropical Mango, a fruity and light flavour made with fresh mango juice and no added sugar I like that we can taste the flavour of mango puree; Green Tea, slightly sweet yet light with earthy flavour notes, and Salted Caramel that has a sweet butterscotch flavour. Each flavour is unique and after tasting the different flavours I am sure you will end up with your favourite as well, which will make you keep wanting more! 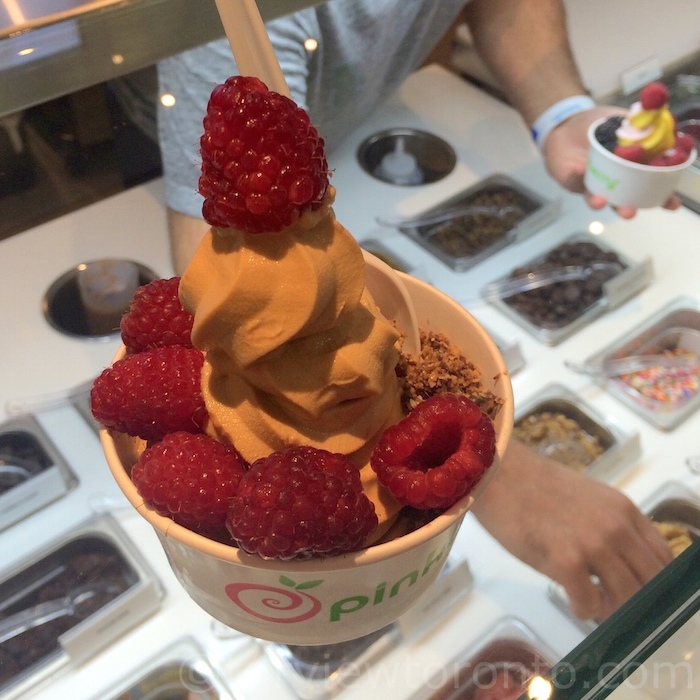 The friendly staff at Pinkberry allows us to taste the flavour prior to purchasing. You can have up to two flavours either swirled together or swirled in the same container side by side. We can get either small, regular, or large serving of the frozen yogurt. Although, I didn't try the option of take home frozen yogurt, it is packed so that it will keep fresh for approximately up to 45 minutes, and needs to be placed in the freezer before enjoying at home or at parties. 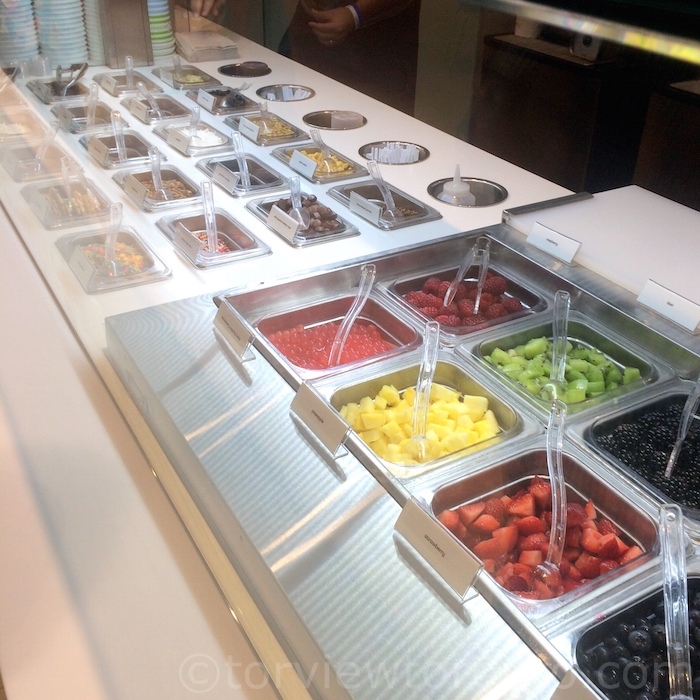 Each cup of frozen yogurt is weighed to ensure every time you purchase you will be getting the same amount of frozen yogurt goodness!